This is my eighth season in the Weekend Warrior Wannabee’s NL-only Fantasy Baseball League. It’s an auction-league allowing ten keepers per season based on contracts and extensions and up to six MILB players per year. Trying to go into upcoming years with value per player is essential in this ultra-deep format. Like most “ultra-rotisserie” leagues it’s not necessarily the biggest name that makes the best keeper. We have two cut-deadlines during the offseason. The first deadline just passed and I was required to pair down my roster to twelve and declare any extensions for long-term keepers. Here are the players and contracts on my 12-man preliminary roster. In order to understand our league rules it’s important to note that a MILB player brought into the league has two years at $5 (considered his rookie year and first arbitration year) and then can be kept a third for the same $5 or signed to a long-term contract. Long-term contracts raise depending on how many years you sign the player for but without explaining the whole system it’s five dollars per year for a two-year extension, four dollars for three years and so on. Everyone else on my 2018 roster is no longer eligible to be kept. As my roster sits at twelve I need to make two cuts before next week. As of this moment the players likely to be cut are Peralta and Guerrero. I cultivated Freddy Peralta in the minors after his trade to the NL and this is going to hurt. But, the risk that Peralta is traded to the AL is real as I don’t think he starts the year in the big leagues. Brandon Woodruff looks to lock up the last spot in the rotation for the Brewers and Peralta is also the youngest of the Burnes/Woodruff/Peralta trio of Brewers pitching prospects ready to contribute. Guerrero is an interesting case as he isn’t relatively well-known. As one of three pitchers who hit 103-mph on any radar gun in 2018 he has future-closer written all over him. Finding a closer at that price in the WWWL is like finding a 7-foot scoring center in the NBA; it doesn’t come around all that often. He however hasn’t secured a look at closer for the Marlins at this point but is having a really great spring training. If I kept Peralta or Guerrero it would be for Raimel Tapia. It’s difficult for me to keep Tapia but one of the things that would trump a cheap closer is a Rockies OFer getting regular AB’s. Tapia has had a decent spring and with Carlos Gonzalez out of the way he’s likely to surpass his pricetag even with modest AB’s in Colorado. The others I view as locked a week-out from the draft. I have exceptional risk/reward value in Martinez, Camargo and Muncy giving me a ton to spend in the auction. 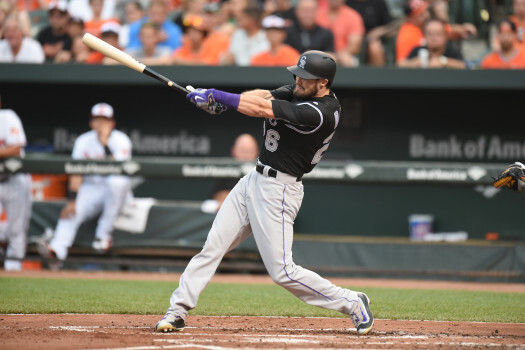 I am not keen on long-term contracts because of the risk involved but signed David Dahl to a two-year deal in hopes he can finally be healthy in the thin-air of Coors field. I have big expectations for Dahl.